Sometimes I just want a quick option (just like only reading a very short text), for food I mean. But it should still be healthy. So Fastfood in good quality at home. 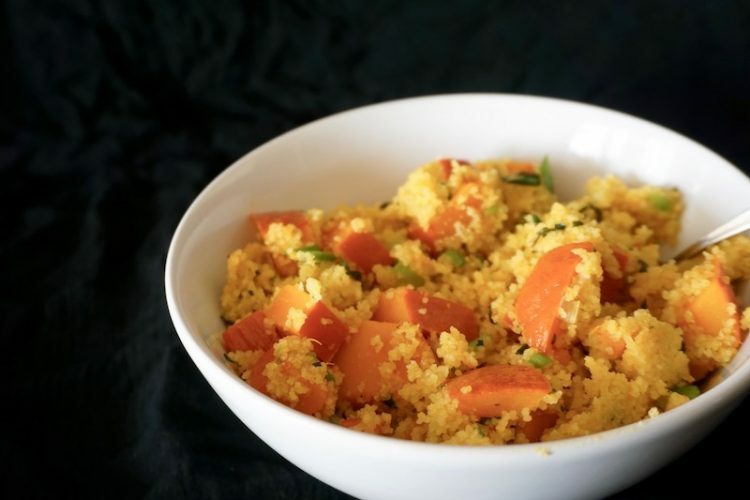 And then I am thankful for a tasty vegan recipe just like this pumpkin-coconut-couscous pan. You can stir it together in under 15 minutes. And the work effort of just cutting up 3 ingredients and string ever so often is minimal as well. Perfect for students like me, especially if the leftovers can be eaten cold as a salad on the next day. Oh and by the way, cutting up mint and pumpkin and freezing it in advance will cut down the prep time for this meal even more. Cut 1/4 of the Hokkaido pumpkin in small cubes (about half an inch). Place the pumpkin cubes in a pot with a lid. Add 1/2 cup coconut milk, 1/4 cup water and 1 tsp powder for broth. Stir, add the lid and place the pan on the stove. As soon as the pumpkin is boiling vividly let it cook for 4 minutes. Meanwhile cut up 1 green onion and mint leaves. Try the pumpkin if it is cooked through enough for your taste. Turn of the stove. You should have about 1/2 cup of liquid still in the pan. Stir in 1/2 cup of couscous and let it steam for 5 minutes under the lid. Add in mint and green onion. Season with salt and pepper to taste. Also tastes great cold the next day as a salad with a bit of lemon and cucumber-cubes.